Read a circle story to the class. I chose “If You Give a Pig a Pancake” by Laura Numeroff and ask again. I explain that it is a story that begins and ends in the same place. However, there are a lot events that occur in between. Create a mini-book out of legal size copy paper. Instructions found here. Students choose a title to work with…I created a list of animal and food related titles for students to select from and they begin creating their circle story. There is also a template for them to follow if they need some help. We go over the guide sheet for the project and I explain that in addition to them creating their circle story mini-book, they must also create a set of sequence cards, similar to these, to go with their story. After the books are completed and we’ve gone over the do’s & don’ts of reading aloud (found here), students practice reading their books. When they are ready, they record themselves reading their books and showing the pictures using iMovie, creating an iStory. Students then create QR Codes linking their iStory and share them with me. I print off the codes and place them throughout the room. Students must scan the codes, listen to the story being read and evaluate their peers using the provided form. They may also refer to their do’s & don’ts notes if needed. 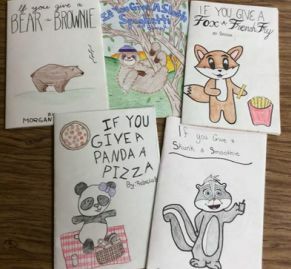 I will say that even my less than super talented students enjoyed this assignment, even though they did grumble a bit at the idea of having to do their own illustrations! Many students donated their stories to our local day care center and that’s where the sequence card activity came in. The sequence cards were placed in an envelope and sent with the book for children to use and practice their sequencing skills. The sequence part of this assignment could be completely optional if you don’t plan on donating the books. I do the same thing. I let the students who are not artist cut of clip art but have to do the background. I had some amazing stories. I found a lot of my materials on the internet since I do not have any resources for any of my 12 classes. My school thinks FAS is baby sitting class. Will be looking for new job in May. Had to buy some text books to copy and student manuals so can't afford to buy lesson plans from teachers. Do you have a rubric for grading the Circle Stories?? This is a great idea. I think my students will love it! I just linked the rubric that I use when grading the circle stories under attachments. Hope your students enjoy creating as much as mine did!